Crude oil prices jumped ahead of the start of U.S. trading on Tuesday on signs of easing Turkish economic strain and supply-side drainage. Swift devaluation of the Turkish lira, compounded by U.S. trade pressure, spilled over into the broader market to rattle investor nerves last week. The national currency has since recovered after the Central Bank of Turkey vowed to do whatever was necessary to prevent the crisis from escalating. Announcing a boycott of U.S. electronic goods on Tuesday, Turkish President Recep Tayyip Erdogan criticized what he said was an “economic attack” by U.S. President Donald Trump. “Our country today has one of the most solid banking systems in the world in all respects,” he was quoted by the state-run Anadolu news agency as saying. Turkish economic relief followed indications from the Organization of Petroleum Exporting Countries that its de facto leader, Saudi Arabia, produced less oil last month. Average production in July, according to secondary sources reporting to OPEC economists, was about a half percent lower than June levels, but still 4 percent higher than the first quarter average. The price for Brent crude oil, the global benchmark for the price of oil, was up 1.75 percent as of 9:17 a.m. EDT to $73.89 per barrel. 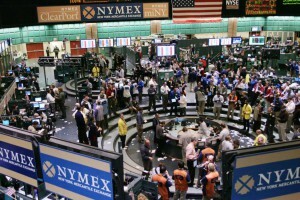 West Texas Intermediate, the U.S. benchmark, was up 1.68 percent to $68.33 per barrel. Momentum will be influenced after the close of trading Tuesday when the American Petroleum Institute releases data on U.S. crude oil and gasoline inventories. A drain would be further supportive of the price of oil. A survey from commodity pricing group S&P Global Platts revealed expectations of a 1.7 million barrel draw on crude oil inventories and a 1 million barrel draw on gasoline. In the global economy, crude oil prices have yet to reflect signs of a slowdown. Eurostat, the European Union’s record-keeping body, reported gross domestic product for the 19 countries that use the euro currency increased 2.2 percent in the second quarter, compared with the same time last year. That’s down from 2.5 percent in the first quarter and 2.8 percent in fourth quarter 2017. In the United States, the Congressional Budget Office reported Monday that it expected U.S. GDP to grow on average by 3.1 percent this year, but slow to 2.4 percent next year. For the five years ending in 2028, real GDP is expected to grow by 1.7 percent. The slowdown was attributed in part to the expiration of temporary cuts for U.S. taxpayers.